To get back to competition requires more than just strength and flexibility. As an athlete, you must be confident you can perform at the highest level and know you can rely on your body to excel under pressure. At San Ramon Valley Physical Therapy, we use our personal and educational backgrounds to help prepare you for returning to action. Whether you are compete on a grass field, wood court, open pool, or cool gym, we can assist you to get back to action. SRVPT provides sport specific analysis to ensure your training techniques incorporate biomechanically correct movement. This includes a biomechanical analysis of your sport, instruction in an exercise program to maximize your strength and flexibility, and advice on how to prevent future injury. 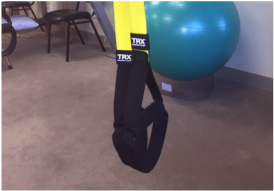 The TRX Suspension Trainer is a great tool that allows for a variety of upper and lower body exercises while maintaing core stability. Our team has extensive dance and ballet background and understand what it takes to get back to action.